MagiCAD contains Europe�s largest database, with hundreds of thousands of products from leading international manufacturers. The products have correct dimension and all relevant technical data. This means your calculations are accurate and the installations can follow your design. Contractors know they can work as planned, saving time and improving quality. New products and manufacturers are introduced into MagiCAD constantly. 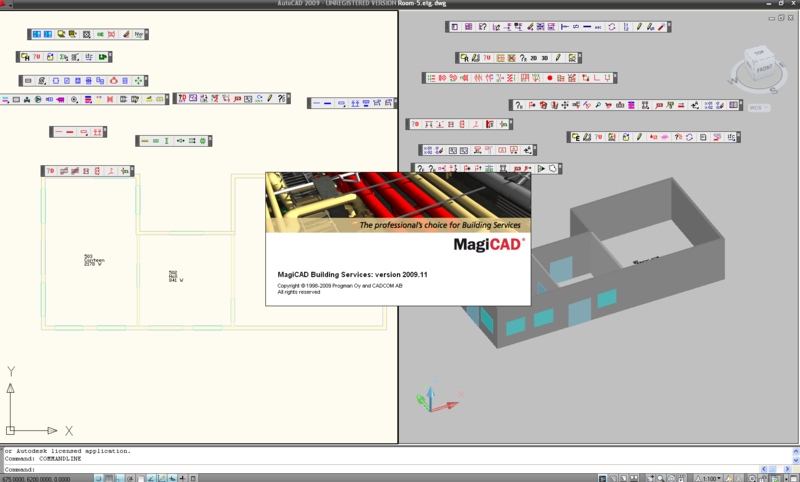 The products are available free of charge for both MagiCAD for AutoCAD and MagiCAD for Revit users. MagiCAD provides sizing, balancing, flow route examination, different sound calculations, heat loss calculations and bill of material functions. Take full advantage of these functions and you will increase your productivity. When designing for example a ventilation system, you can draw everything with one duct or pipe size and then let MagiCAD do the sizing. It is fast and very efficient. Another basic function in MagiCAD is automatic sound calculations. You get a full and detailed report on sound attenuation, sound generation and sound levels. If you prefer to work only in 2D, you won�t even notice that MagiCAD produces a 3D model in the background. And it also works the other way around. Produce a 3D model, and all you need for printing 2D drawings is produced automatically. You can have a 2D and 3D view open at the same time. Any change you make in one view is automatically updated to the other view. MagiCAD�s collision control covers all electrical and HVAC systems. You can even check for collisions with the buildings structure, directly from a reference drawing. Collision control saves time and makes cooperation among project partners very easy. The risk for running into installation problems on site is minimized. Making cross-sections is easy. Place the section marks and show the area and direction - MagiCAD creates the cross-section automatically. When you modify the plan drawing you can update the cross-section with a couple of clicks. Many manufacturers develop special software for calculation and product selection, particularly for more complex products and systems such as air handling units (AHUs). Plugins are used for connecting this software with MagiCAD. When you have selected the right product you can import and place it in the MagiCAD model as any other intelligent MagiCAD object. With two updates out every year, MagICAD evolves at a steady pace to be in tune with your demands. We keep the benefits of being easy to learn and easy to use, and add new features and functions. More than 10,000 licenses are sold to building services designers in Europe, Russia, China and other parts of the world. The company developing MagiCAD is Progman Oy, with headquarters in Finland. Progman has more than 25 years of experience in developing software for the building industry. When designing with MagiCAD, you have all it takes to be part of any BIM - Building Information Modeling - project. � And you can make attractive visualizations with high-quality 3D images and animations in Navisworks and other applications.